Rhees, Roland J. 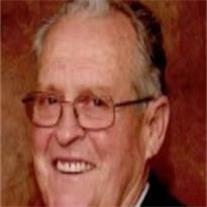 (Bud), 83 of Mesa, passed away July 1st in Mesa, AZ. Canadian Mission for the Church of Jesus Christ of Latter-day Saints. Utah Power & Light’s Idaho Division. for 10 years that produced more love and joy than revenues. A sister Marilyn Rhees Woodbury, and a sister-in-law Connie Rhees, 14 grandchildren, 28 great-grandchildren. Funeral Services 11:00a.m.,Wednesday, July 6th, at the LDS Hawes Ward, 2265 S. Hawes Rd, Mesa, AZ with visitation 1 hour prior. Burial at the Mountain View Memorial Cemetery 7900 E. Main St. Mesa. In lieu of flowers a donation can be made to the Perpetual Education Fund of the Church of Jesus Christ of Latter-day Saints.